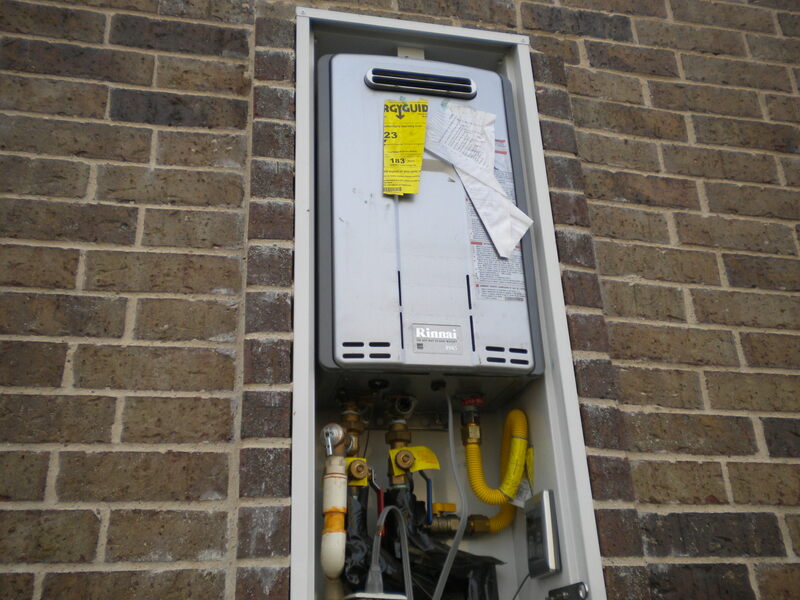 Our home inspector discovered a gas leak at a tankless water heater during this Irving home inspection a little while back. He was performing a Builder’s Warranty Inspection for the clients. 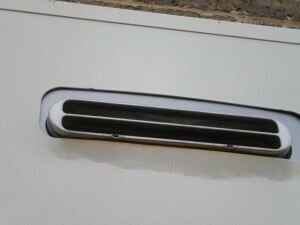 These owners were fortunate that the unit was mounted and installed at an exterior metal cabinet. 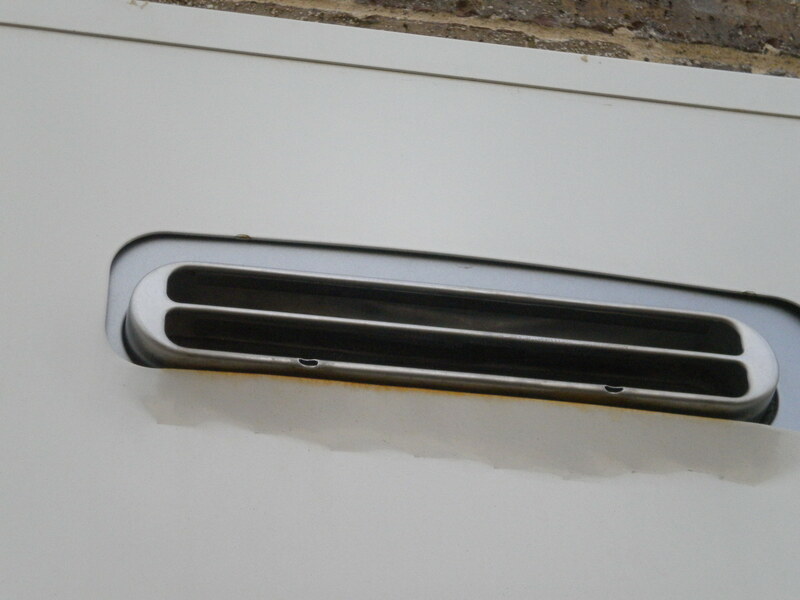 It’s not uncommon to see these newer units installed inside a metal cabinet inserted into a niche in the exterior wall. But a gas leak is uncommon, and as always, it is best taken care of immediately so as to pose the least amount of hazard to the occupants. 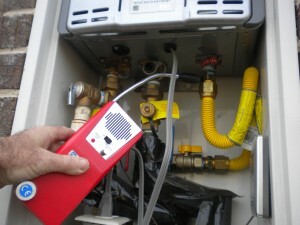 Gas fittings are usually pretty safe and, when tightened to the correct pressures, will not leak. This one had not been properly tightened and was leaking just enough for our detector to register the leak. There is another problem we are finding frequently with these niche cabinets and covers. 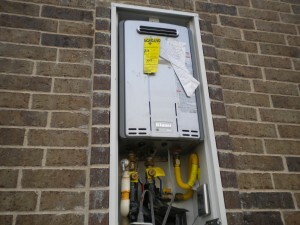 The cabinets seem to be considered universal, since we find several brands of tankless units installed inside them. The problem is, however, that the mounting slots are at slightly different locations on different brands. So, when some units are mounted inside, the gas flue discharge port is off center, and the cover will not fit back on properly. If you notice in the photo, the cover has been bent with pliers or some other tool to make the cover fit. The result? We’ve seen the covers lying on the ground before, where they just fell off because they were not secured properly. Others were on so tightly they had to pried off. We think this is pretty sloppy, and we don’t think the manufacturers would appreciate the treatment. In fact: they might void the warranty on the water heater!! More and more new construction home owners in the Metroplex are deciding to have a property inspection performed on their homes before the builder’s one-year warranty expires. We happen to think that is a good idea, and we stand ready to help. But, whether you use House Exam or another company, you should protect your investment by making the builder repair what he is responsible to do correctly to begin with. Leave your comments or questions below. We are open for questions, and we’d be glad to hear from you.